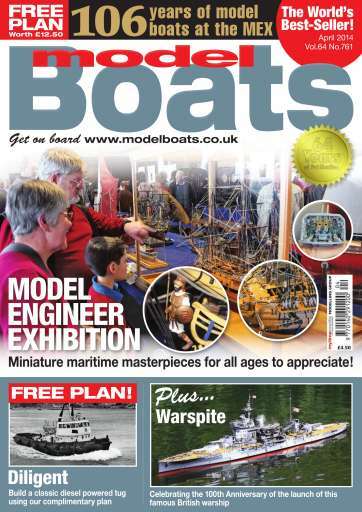 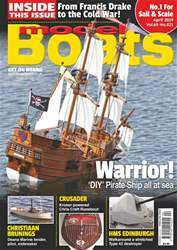 This issue has its main features, a Tug Restoration project by Dr. Marcus Rooks; Two from One by John Matuin in which he rather cleverly creates an alternative lifeboat superstructure for his Captain's Boat previously published in Model Boats and to be present at the One Hundredt Anniversary of the launch of HMS Warspite form Devonport Naval Dockyard in 1913 and his account makes interesting and informative reading. 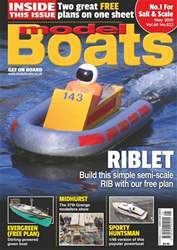 We also have Part Two of the unique Gibbs Aqua amphibious car model constructed by Bob Hinton and a report by Colin Bishop about the top-class model boat entries at the 2013 Model Engineer Exhibition just before Christmas. There are your usual favourite regular articles such as Range Finder, Boiler Room, Flotsam and Jetsam, plus Reader's Models and Around the Clubs, as well as Test Bench and your Free Private Advertisements. 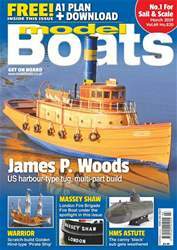 We also welcome Craig Dickson to these pages, writing on behalf of the British Model Powerboat Racing Society, so I hope we have managed to include plenty of high quality and well illustrated reading for all model boat enthusiasts.